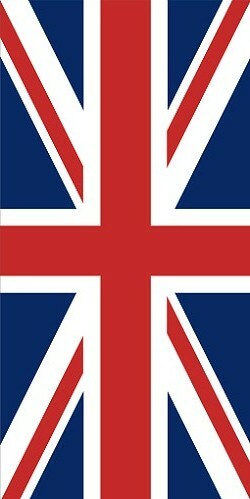 Tom Simpson (The 1960s Racing Cyclist) "If"
The Union flag of the United Kingdom that seems to emplify Tom Simpson when he went to live abroad as one of the few British riders who initially took the plunge back in the late 1950s. Always the Brit who wanted to keep his faith that one day this country would eventually catch up with the continent in his chosen sport starting with himself as he throughout his career produced outstanding performances. 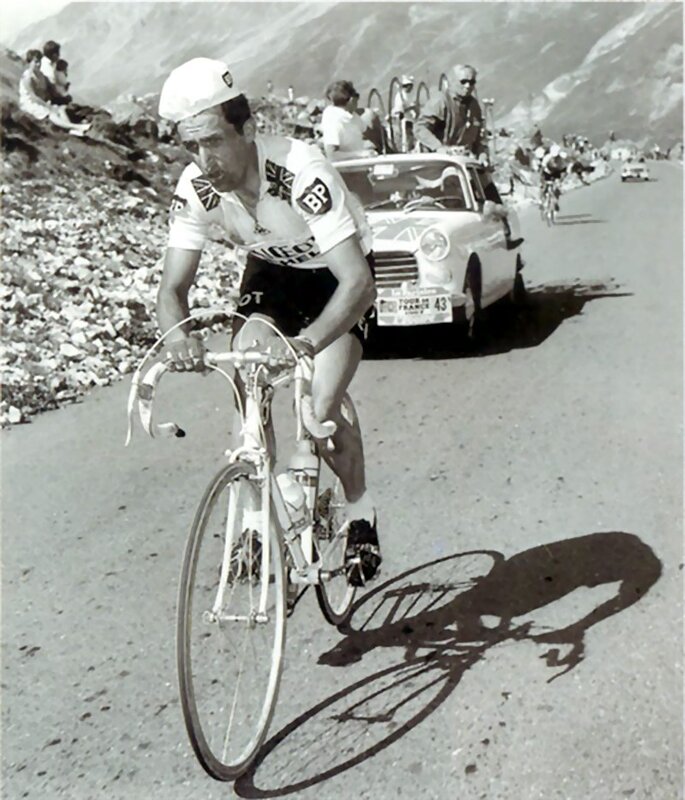 Above image shows the advert carrying the win by Tom Simpson after his fantastic win in the Bordeux Paris marathon road race in 1963, and on the right wearing the World professional road champion's jersey he won in the 1965. It wasn't so much the wins that Tom Simpson secured as these were few and far between, but it was the actual wins that he achieved because ones he did were the most prestigious in his professional career. His out and out style of racing or never knowlingly when he was beaten bought out so much favouritism wherever he rode and just kept increasing his popularity when he rode, France,Belgium, Italy and of course dear old UK his home. 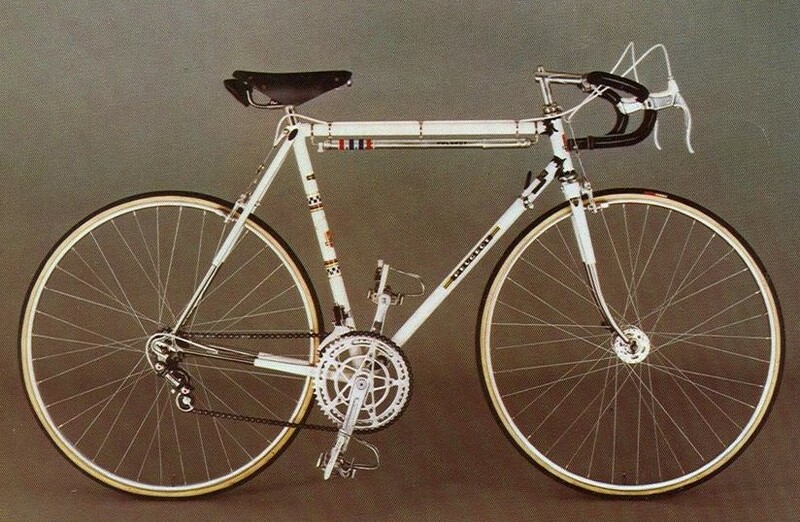 The above image of the Peugeot bike is actually from the middle of the 1970s, however by comparing this picture to the coloured one above of Tom Simpson there seems very little that had changed over a number of years. I actually bought one of these when they were imported into the UK, unfortunately from that personal experience I can truly say it was "much to be desired!" The frame make up was really weird to say the least and the accessories as against Campagnolo, well in the end I used them on one of my cyclo cross frames. Also the frame just got given away. However of course so many years later if I had it in one piece it might be worth money on Ebay as a retro item of some significance. 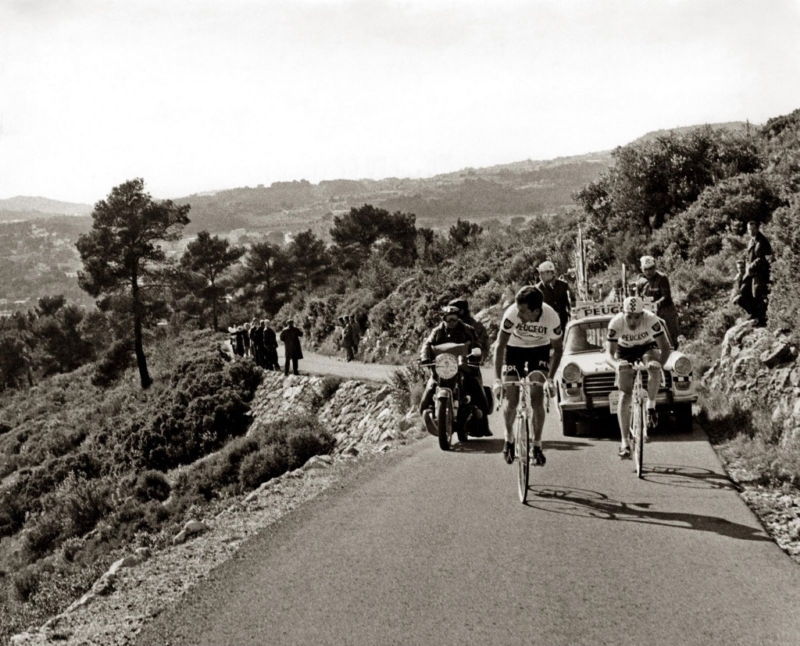 Below Tom Simpson on that fateful day on Mont Ventoux. I have read quite a number of editorials on Tom Simpson, one way or another, and in point of fact I had to start getting in very early copies of material from the continent to get a more in depth idea of the Brit abroad. 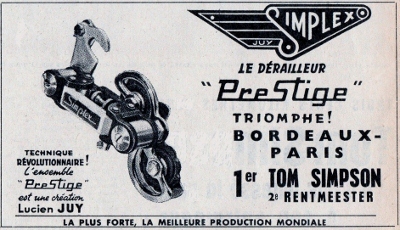 Strange as it maybe when I originally got involved in cycling, the name Tom Simpson did not really mean much to me other than actually later on remembering seeing the unfortunate images of him when he collapsed upon Mont Ventoux on the BBC television channel during the day in question . Even reading that Barry Hoban had married Helen Simpson still didn't click for me as I just looked upon this as a cyclist marrying in the off season - that was it. 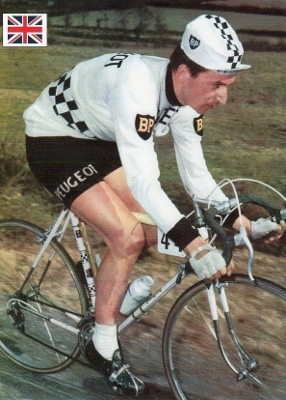 It wasn't to be until some time later when I started noticing the all so familiar white chequered jerseys of Peugeot/BP. Reading later on that Billy Bilsland from Scotland had signed for Simpson's old trade team for around £ 50 a month in 1970? This I had sourced at the time from a editiorial that dealt with any number of sports in it's magazine, so I can only assume that the editor thought the story about a Scotsman ridng a bike in France was good material, and it just goes to show you that these little snippet reports can stay with you for a long time. 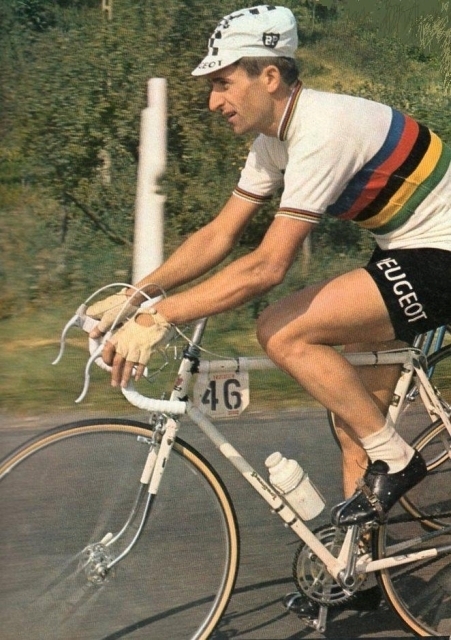 When I went abroad in 1977 I remember riding the bike through some exTour de France area down in the south of France, not far from Toulouse and noticed a big sign with Danguillaume's name (A Peugeot rider at that time) written on it. It looked very much like one that had come off a team car, and also while I was out there, well I was really into trade team jerseys and so popped into one of the bike shops in Toulouse and bought a Peugeot team jersey. This was made out of wool it seemed, although the manufacturers were starting to use other materials. Also by this time Peugeot had changed their alliances to Esso, so the shoulder badges had changed to an oval shape than the ever familiar shield style. 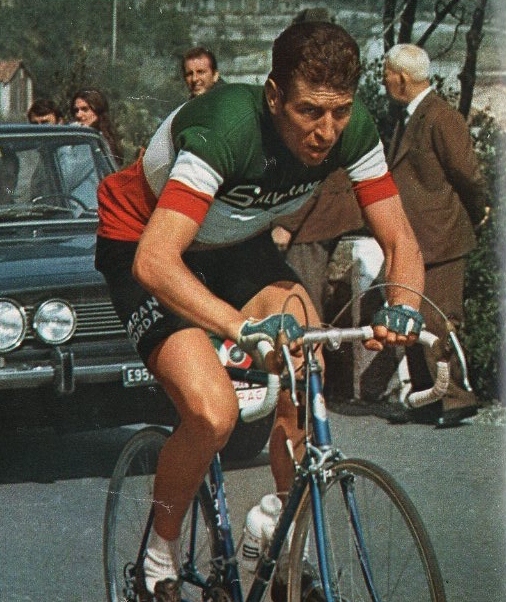 Above, Felice Gimondi seen in the Italian Road Champion's jersey, riding for the Salvarani, the trade team that Tom Simpson and Vin Denson were to ride for in 1968, the year that followed Simpson's death. If he hadn't died professional cycling on the continent would have turned out so totally different. Read my book - Tom Simpson "If", and see my angle of what may have been? A professional career book or booklet on Tom Simpson that actually surpasses the year of his death and delves into the following year or two when cycling history may well have been totally rewritten by him if he had survived. Not to be looked upon as being gross, purely speculative in it's format. There have been a number of good quality books written on Tom Simpson in one plot or another and I could not have competed with these authors,hence the reason I have taken a different path to theirs. Mine will be more to do with homing on his seven years as a professional bike rider. Enough has be written although to be fair I will be adding larger and not seen images that I have pulled from my own library of pictures etc. I had formally though about a short 48 page booklet and saddlestitched to make it short and sweet coupled with good quality pictures,more graphic than not. However the more images I found the more I thought perhaps I may have to go down a different path in that department. So for the present I cannot say or even guess until such times I have clearer vision as to what amount of editorial will eventually be involved, although to be fair it probably be more classed as a graphic novel.